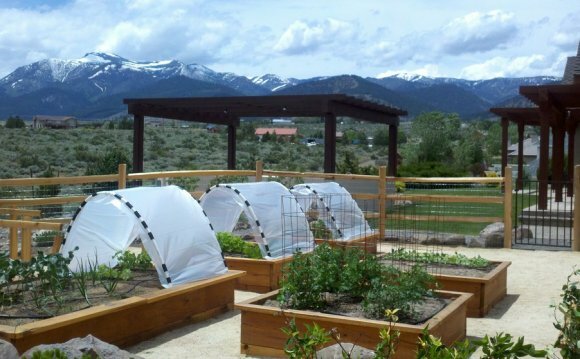 Get creative with your vegetable garden design. Consider creating a series of decorative raised beds with wood-chip- or gravel-lined paths between. Check out photos of historic French gardens for inspiration - they're beautiful and efficient. Plant vegetables with their looks as well as flavors in mind. Alternate, for example, pretty purple cabbage with snowy white cauliflower in a row. Or experiment with planting in blocks and clusters rather than rows for a more decorative effect. Many vegetables lend themselves beautifully to containers. Lettuces in various colors are gorgeous in window boxes. Patio-type tomatoes are ideal in large pots. Hot peppers ripen to rich colors that are attractive when mixed in with annual flowers such as marigolds and vinca. Tomatoes probably grow better in flower beds than they do in the traditional vegetable garden. That's because they should be moved to a different spot each year to prevent disease, and space is often limited in a vegetable patch. Also, tomatoes do better when isolated from other tomato plants because disease can't hop as easily from plant to plant. Lettuces make a great edging plant, especially those that are deep reds and purples. Plant in a row along the front of a bed or border. Don't let a little shade deter you from planting vegetables. Fairly shade-tolerant veggies include beets, Brussels sprouts, cabbage, cauliflower, garlic, leaf lettuce, spinach, turnips, radishes, and beans. Seek out vegetables in bold colors to interplant among the flowers. Swiss chard, for example, is available in a rainbow of colors. Or try brilliant yellow sweet peppers. Pole beans have attractive heart-shape leaves that are fairly decorative. They're good for planting on arbors, along fences, or on any trellis. Some mustard greens and kales have gorgeous fall color and are ideal for tucking into containers and borders for color late in the year. Try Osaka Purple mustard greens or one of the red or purple kales. Brighten salads with edible flowers. Grow nasturtiums and violas and toss a few petals in with your lettuce for a pretty salad.